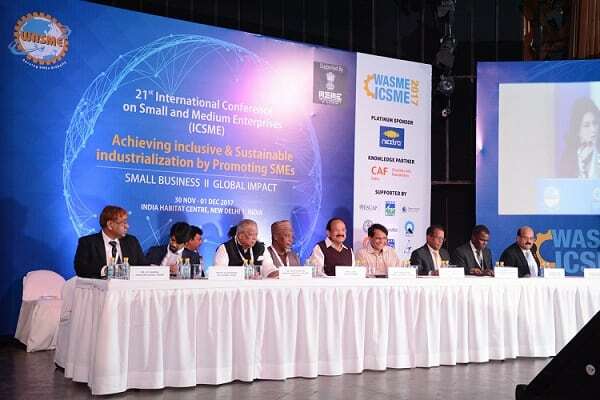 Sustainable industrialization with SME development should be the primary development agenda of national governments, Vice President of India, Shri M. Venkaiah Naidu said at the 21st International Conference on SMEs being organised by the World Association for Small and Medium Enterprises in New Delhi today. The Vice President emphasized that SME development needs to be centred around sustainability. He added that alleviation of poverty while simultaneously creating employment and wealth by following the principle of inclusive growth was the only way towards a peaceful world. Suresh Prabhu, Minister of Commerce and Industry, who was the Guest of Honour at the session, said that the government aims to get a substantial share in the manufacturing sector’s contribution in GDP from SMEs. He added that the government plans to increase manufacturing sector’s share in the GDP to 20 percent. Prabhu added that SMEs are the backbone of the economy and without them, the benefit of growth can never accrue to a large number of people. The two-day ICSME conference deliberates on issues concerning SME development and their need to align with the goals of achieving sustainable development through responsible business practices.The theme of the conference is ‘Achieving Inclusive and Sustainable Industrialization by Promoting SMEs: Small Business, Global Impact’. SoomilduthBholah, Minister of Business, Enterprise & Cooperative, Mauritius, and Amir Hossain Amu, Minister of Industry, Bangladesh were the other Guests of Honour. Among those present at the inaugural session were Mr. Dumisani J Msibi, Vice President, WASME & Group MD, FINCORP Swaziland; Mr. AlhajiBabale Umaru Girei, President, WASME & Chairman, Standard Microfinance Bank Nigeria; Ms. Meenakshi Batra, CEO, Charities Aid Foundation (CAF) India; and Mr. G.P. Agarwal, Secretary General, WASME. The event brings together key stakeholders from diverse organisations to engage in meaningful deliberation on SMEs. This initiative is supported by CAF India and Grant Thornton as knowledge partners for ICSME and WASME SME Excellence Awards 2017, respectively. SMEs Must Be on Primary Development Agenda of National Governments Says Vice President Naidu 0 out of 5 based on 0 ratings. 0 user reviews.